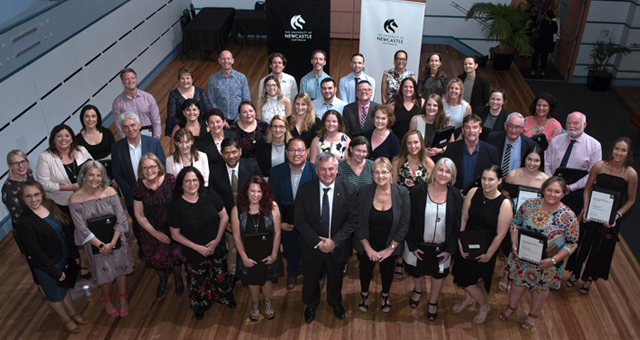 The University’s new Vice-Chancellor, Professor Alex Zelinsky AO, presented individual and team awards across seven categories at the awards ceremony on Monday 3 December 2018 at The Conservatorium in Newcastle. “It is a privilege for me to be hosting my first Awards ceremony and to publicly acknowledge hard work and dedication that underpins the success of a University that is recognised for delivering world-class research and education,” Professor Zelinksy said. Download the 2018 Vice-Chancellor’s Awards program (PDF 500KB). Denise prioritises student learning through innovative and entrepreneurial teaching designs. As a Lecturer in the School of Health Sciences, and currently completing her PhD, Denise has revolutionised oral health teaching and learning with the re-development of simulation-based education and original creation of oral health simulators. Denise’s innovations, including the world’s first life-like dental local anaesthetic simulator, and a fully-immersive and interactive dental local anaesthetic virtual reality program, are key to the University of Newcastle’s outstanding reputation for its Bachelor of Oral Health Therapy. The professional staff team at the Gomeroi gaaynggal Centre coordinate and deliver an outstanding research and community engagement program with the Indigenous community in Tamworth. They provide a safe and culturally appropriate environment for women of all ages to gain a better understanding of artistic and cultural practices, health and education whilst connecting with each other, their culture and their local Indigenous community. The team exemplify the importance of promoting a caring, supportive and culturally safe environment where each team member acts as both a peer and a mentor and provide evidence based pathways to health, social and cultural services. Elise is an exceptionally gifted researcher who has steadily developed an innovative research program on the regulation of emotion. Her work is both theoretically original as well as of direct applied relevance, a combination that explains her outstanding funding track record. Elise is driven by a deep curiosity about the human mind and consistently displays a very professional and relentless work ethic. Elise has successfully collaborated with several leading figures in her field. Jordan has demonstrated a clear commitment to research excellence, through numerous high-impact publications, award winning conference presentations, highly competitive research income relative to opportunity, and innovative research projects. Jordan’s exceptional research metrics are proof that he is on a rapidly accelerating career trajectory. Notably, Jordan was recently awarded funding to develop a smartphone application and innovative video resources to support teacher professional learning and the delivery of a school physical activity intervention (known as Resistance Training for Teens) based on his PhD work. Anna is an extremely passionate academic who has achieved great success in establishing rock mechanics as a research area within Civil Engineering. Her outstanding track record focused on industry engagement, international collaborations, and research quality and integrity, demonstrates her commitment to innovation and impact. She has shared her passion for research with several HDR, Masters students, and early career academics, demonstrating highly training capabilities and exceptional care and respect for her students. Anna is an extremely dedicated supervisor who considers her role of primary importance in her students’ growth as researchers and engineers of the future.